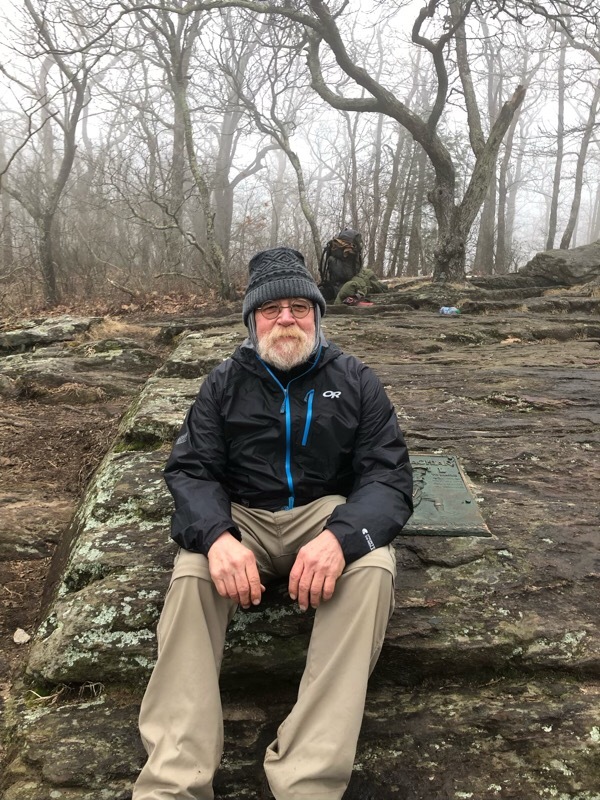 Zin Master (Ken Nieland) after hiking for three days and developing blisters, has been off the Appalachian Trail for 17 consecutive days. He has been staying with his in-laws in Tennessee. His hope is to return to the trail on Tuesday, February 13. He is planning on leaving Tennessee at 4:00 am in order to drop off his rental car in Blairsville, Georgia when Enterprise opens at 8:00. He has arranged for a shuttle driver (Pretzel) to take him to the trailhead at Tesnatee Gap. From there Zin will hike 6 miles southbound (SOBO) – back to Neel Gap while Pretzel takes most of his supplies with him. (This is called slackpacking – someone takes for heavy stuff like your tent, sleeping bag, etc. 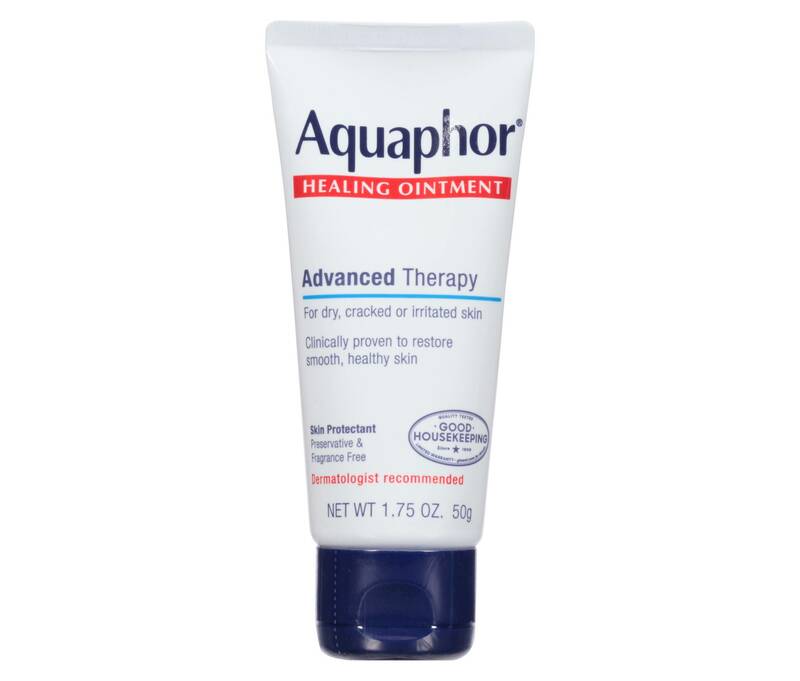 and meets you down the trail while you hike with just the needed supplies for the day.) Zin will stay at Blood Mountain Cabins or Mountain Crossing on Tuesday night. Pretzel will pick him up on Wednesday morning and shuttle him again to Tesnatee Gap and Zin will continue his NOBO hike from there. Sounds complicated? I let you know how it all turns out when he posts in his journal in the next few days. 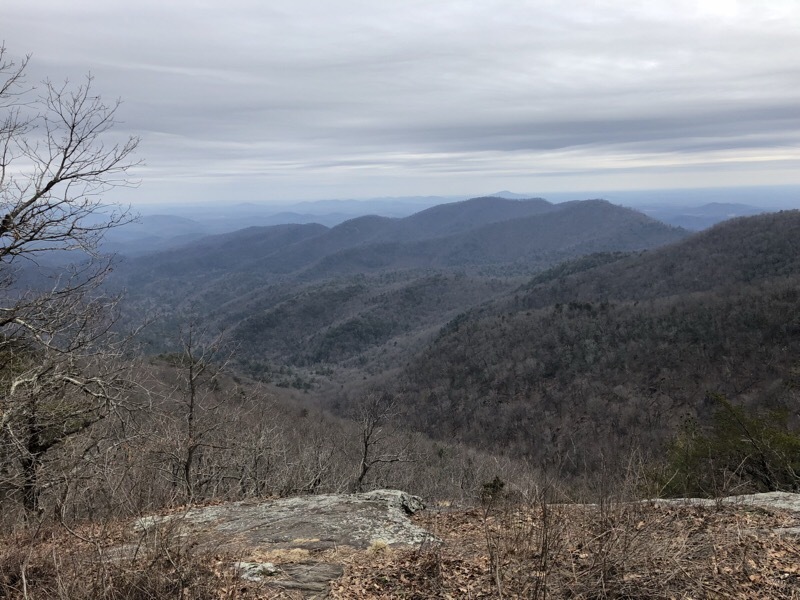 Vagabond Jack (Jack Masters) began his thru-hike on Appalachian Trail on February 1 with a 5.2-mile hike from Springer Mountain to Long Creek Falls. Day Two found him helping another hiker in distress to find refuge in Hightower for a hike of only 3.4 miles. Vagabond took two zero-days in Dahlonega, Georgia to avoid some winter weather. 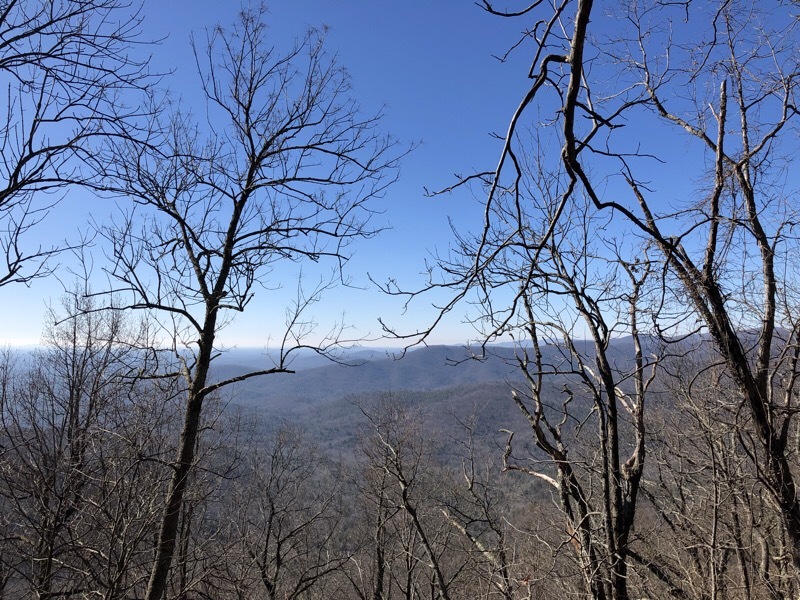 He returned on February 5th and hiked 7.2 miles from Hightower to Gooch Mountain. His longest trek so far was on February 6th from Gooch Mountain to Woods Hole Shelter (12.1 miles). 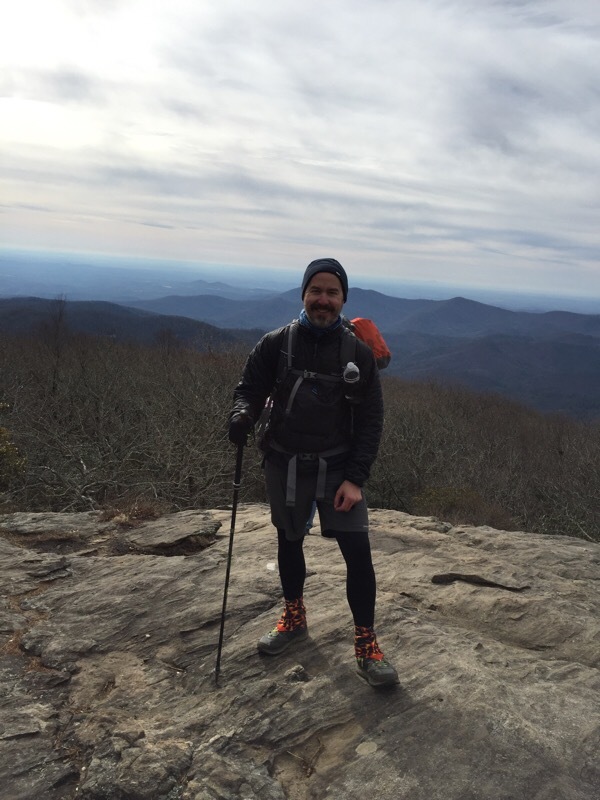 He took a short day on the 7th with a 3.5-mile hike into Neel Gap and then a ride into Blairsville, followed by a 0 day on February 8. Vagabond Jack returned to Neel Gap on the 9th and hiked 11.5 miles to Low Gap. The next day he managed 7.3-miles from Low Gap to Blue Mountain Shelter. 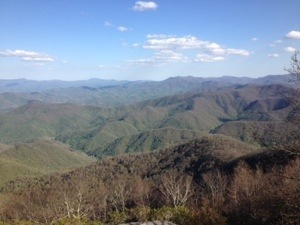 He then hiked into Unicoi Gap (2.4 miles) and took a shuttle into Hiawassee, Georgia. He zeroed in Hiawassee on the February 12th. 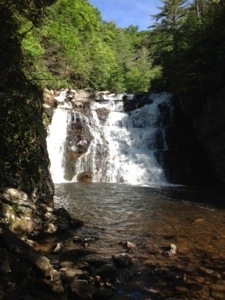 Vagabond Jack plans to return to the trail on the 13th and hike from Unicoi Gap to Tray Mountain (about 5.7 miles). My prayers go out to both these hiker. They have both had a difficult, discouraging start. Tuesday (2/6/18) brought a 12.1-mile trail to Vagabond Jack’s agenda. 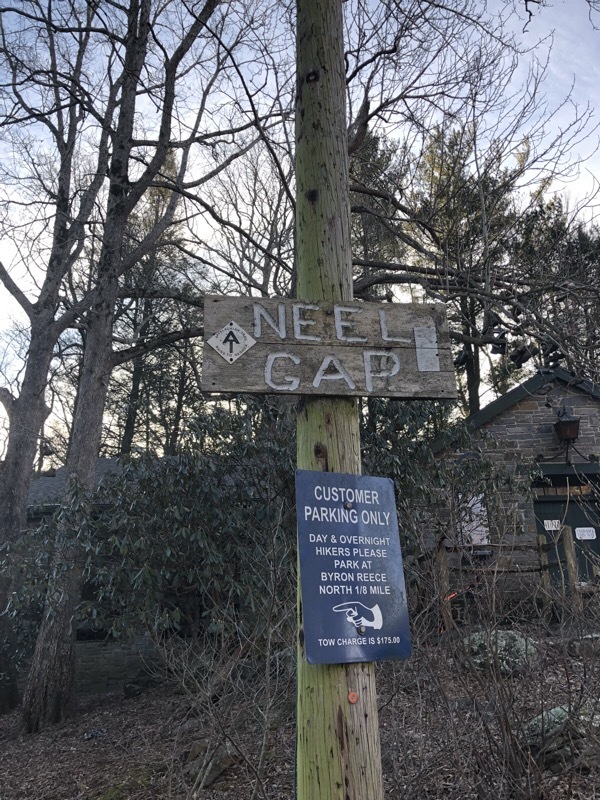 The goal was to walk to Wood’s Hole Shelter, only 4 miles from Neel Gap and civilization. He was hoping to be on the trail by 8:00 but his need for some added sleep delayed his start by 45 minutes. He was 5.2 miles down the trail by noon when arrived at Woody Gap and State Route 60. It was here that he experienced his first Trail Magic (what I would prefer to call Trail Blessings). A young man hopped out of a car and asked Jack if he was a thru-hiker. He handed Jack a banana and some words of encouragement. Jack continued down the path and was rewarded when he reached Preaching Rock with beautiful views of some the valleys and mountains of the AT in Georgia. About 3:00, he arrived at Lance Creek campground with another 4 miles to Woods Hole Shelter. Rain was predicted for early evening but had not started at 3:00. He did not want to set up or tear down his tent in the rain, so he decided to continue to the shelter. He arrived about 5:45 and the rain was still just a threat in the evening sky. He made himself comfortable in the shelter realizing that he was the only one there. He went to sleep knowing that he was only four miles to Neel Gap, but also aware that he would need to summit Blood Mountain on the way. Vagabond Jack woke up to rain on Wednesday morning. Knowing that he had a short hike into Neel Gap, he decided to wait for a while hoping that the rain would calm down. About 10:30 the strength of the rain began to weaken and by 11:00 Vagabond Jack was on the trail. Blood Mountain is the real deal. It is a challenge to climb, but it presents a more dangerous descent. It was foggy and misty as Vagabond Jack made his way up and over the summit. The large, rain-slickened rocks demanded the use of his hands to maneuver down the steep sheets of rock. He was tired and thirsty when he walked into Mountain Crossing, the outfitters at Neel Gap. It was about 3:30 so he bought some food, grabbed a coke and caught a ride to Blairsville, Georgia, about 14 miles away. He checked into the Season’s Motel and took a long hot shower. He is taking a zero-day in Blairsville on Thursday and should be back on the trail on Friday. Grateful 2, a thru-hiker from Chattanooga, and his son, Gooseman, Have begun their attempt at hiking 2,186 miles through 14 states on the Appalachian Trail. They began their journey on March 18 and have trekked 15.8 miles. Their second night on the AT was spent at the Gooch Mountain Shelter. This post finds the father/son team on day three of the trek. March 21 Today was a day for big adventure (7.2.miles). An anticipated climb over Blood Mountain with the reward of real food at the end of the descent. 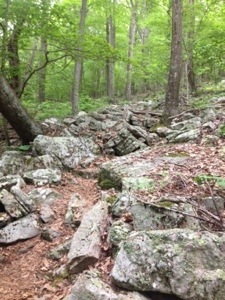 The descent down to Neel Gap was a brutal rock scramble. Grateful 2 and Gooseman rented a cabin at Blood Mountain Cabins. A few hours after their arrival a horrific storm enveloped the area – heavy rains, marble sized hail, fierce winds, lightning and thunder. March 23 Father and son hiked 8.2 miles today in an attempt to get back to civilization. They should be at Unicoi Gap tomorrow. Gooseman’s knees are still not doing well so they are planning to meet Grateful 2’s wife and take a couple of days off for them to recuperate. March 24 The hike up and over Blue Mountain today was quite difficult. The 6.1 miles trek involved 40 degree temperatures with 30-40 mph winds with rain and fog. Gooseman’s knees were still bothering him significantly, so the men eventually decided to hitch a ride into Hiawassee, Georgia. They ended the day warm and dry. March 25 “Zero Day- I cried. And I’m not a crier. I got up from the bed and went to the bathroom of this two-bit motel room where my wife, son, and I are staying and I cried some more so they wouldn’t hear me. I cried hard. Gooseman has decided he’s going home. His knees are hurting, he has a sinus infection, and he’s decided to go home. I’ll miss him so much but that’s not why I’m crying. We’ve had a great week and shared a lot of laughs. It will be hard without him but that’s not why I’m crying. I’m crying because I hurt for Gooseman. What many of you don’t know about Gooseman is that he has autism. I’ve watched him his whole life not be accepted. I’ve watched him try so hard to be successful in life, and he struggles. He’s doesn’t have a job and he still lives at home. He’s a good man with a great sense of humor, but he struggles. He’s generous and loves giving to others. He always stands up for the underdog. I remember lying in bed before I began my thru-hike adventure of the Appalachian Trail trying to image the journey and what I would see, the experiences that I might encounter, the people that I would meet, and the animals that would cross my path. I remember my mind going to the topic of sleep as I felt so comfortable in my own bed. 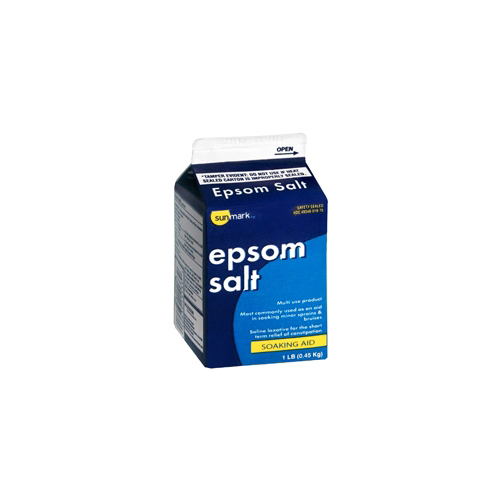 Would I be able to get to sleep, would I get enough sound sleep to feel rested in the morning, would I find good spots for my tent or would I be sleeping on rocks and roots that would prohibit a peaceful slumber in the woods? I tried to think of climbing Mount Katahdin (a mountain that I had never seen before) and arriving at the famous brown sign that graces the northern terminus of the AT. My mind’s eye could never focus in on that picture – I just could not see myself on the summit. When I arrived at the Tableland, the gateway to the summit, with a distance of just 1.6 miles to the iconic sign, the reality began to set in that I was going to make it. With one mile to go I walked past Thoreau Spring (just a trickle on September 24, 2014) and began the final climb to the summit. Then I saw the sign in the distance and realized that many hikers were at the top celebrating their victory and the climax of months of hiking. During this last mile of the hike, a principle that I had incorporated in my life during my doctoral studies came crashing into my mind. 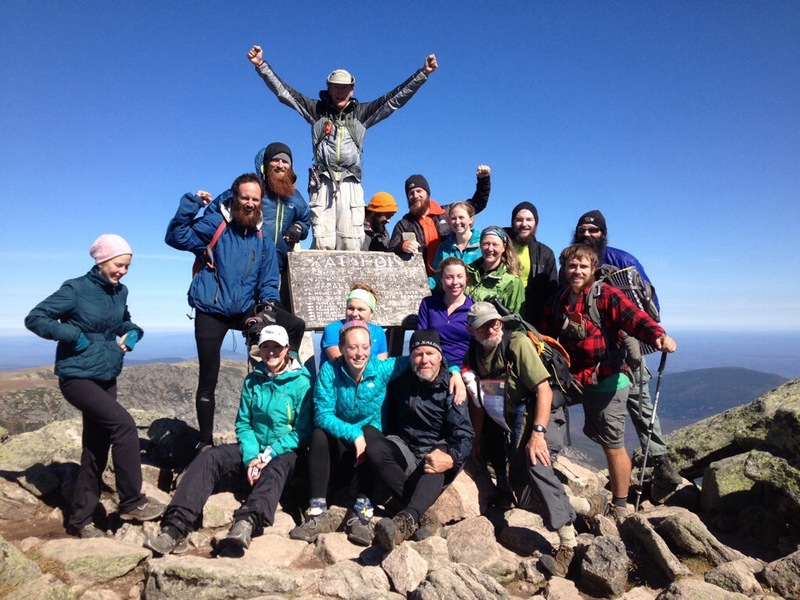 Katahdin was not the reward. The fantastic sign at the summit filled with celebration, high-fives, hugs, and voices of congratulations was not the reward. The journey was the reward. The sign marked the end of the journal, the last page of the recorded adventure, the final entry documenting the walk of 2,186 miles. It was the period after the title, Thru-hiker. It was a crowning experience to stand atop the sign and shout a victory cry of joy. But the real reward was the journey. The 5 million steps counted one at a time. The sunny days and the rain storms, the sweltering hot July days in Pennsylvania and the cold nights in September in the wilderness of Maine provided the weather that defined the journey. The special friends and bonds of brotherhood that were crafted along the path formed the relationships of the reward. Each campsite, shelter, hostel, and hotel brings a memory of the reward of the hobo lifestyle and independent uniqueness of the thru-hike. No two thru-hikes are the same and part of the reward is working through the personal struggles, victories, joys, and tears that make up the walk. On the last day of the hike, the brown sign was a great reward. But reflecting back on the journey and this life-changing experience, the sign plays a pretty small part. Mount Katahdin was amazing, but so was Blood Mountain in Georgia, Mount Albert in North Carolina, Thunderhead Mountain in Tennessee, McAfee Knob in Virginia, Mount Lafayette in New Hampshire, and about twenty other absolutely incredible vistas experienced along the trail. The reward is reading my journal and reflecting on the faithfulness of God – everyday, in every state, every night, and in every need – always protecting, always guiding, always providing. The journey was the reward.